The 44.5 metre motor yacht New Master, listed for sale by Vesa Kaukonen at KK Superyachts, has had a price reduction of €500,000. Designed by naval architect Vincenzo Ruggiero, New Master was built in steel and aluminium by Italian superyacht yard Baglietto to RINA class and launched in 2001 as the first project from their La Spezia facility. Owned by the same family since her delivery, she has been constantly maintained and upgraded since new. 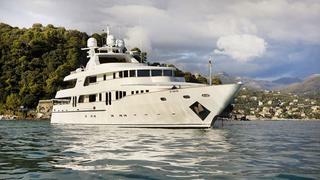 She now features new paint, new teak decks, and a high-end audio-video system including Sky television receivers with a Kaleidescape on-demand audio and video server. Her hull and superstructure were repainted in 2011 using Awlgrip paint and the hull was sandblasted in 2014 and Boero self-polishing anti-foul applied. A comfortable interior designed by Elisabetta Ruggiero has spacious accommodation for up to 12 guests in six well appointed cabins, all with en suite bathroom facilities. These comprise a master suite on the main deck, a twin cabin on the upper deck with three doubles and a twin on the lower deck. In addition, there are berths for ten crewmembers in five cabins. Interior volumes on this yacht for sale are vast and there are ample deck spaces for entertaining and dining al fresco, particularly on the huge aft deck with comfortable rattan armchairs, cushions and occasional tables. Twin 2,447hp Deutz engines give her a cruising speed of 16 knots and a range of 4,440 nautical miles at 12 knots. Furthermore, she has been retro fitted with zero-speed stabilisers. Available to view in Monaco, New Master is now asking €7,450,000 with VAT paid.